Up for your consideration is a Mr Mrs Potato Head Parts HUGE Lot Pieces Disney Goofy Donald Police Fire Iron. • Style: Disney, Mr, Mrs, Iron Man, Farm, Police, Fireman. • Size: 100 pieces. Mr. & Mrs. Potato Head Lot. Condition is Used. Great condition. Everything in picture included. 34 pieces total plus big and small potato. Shipped with USPS Priority Mail. Gently used. Only includes pieces shown (15 total). LOT OF 16 PARTS! Condition is Used. All still in good playable condition. Last photo is of potato head pumpkin accessories - turn your halloween pumpkin into a potato head! Photo is of actual item that you will receive. 2000 Mr. Potato Head Hasbro Lot 2 Yellow Arm Hand Part Only Playskool Mrs Ms.
Up for sale is a Mr Potato Head Lot of 2 Yellow Arm Part ONLY. Once the window expires an unpaid item case will be opened. 2000 Mr. Potato Head Hasbro Lot 2 Yellow Ear Part Only Playskool Mrs Ms.
Up for sale is a Mr Potato Head Lot of 2 Yellow Ear Part ONLY. Once the window expires an unpaid item case will be opened. Random pick from 6" to 5.5" size bodies. Up for sale is a Mr Potato Head Lot of 3 Parts ONLY. Once the window expires an unpaid item case will be opened. Makes a great present for any child to love and play with. Big Lot of Mr. Potato Head bodies, parts, and pieces a Big Darth Tater storage container! The glasses all have plastic stress marks as shown. Freshly washed and ready for play! 2000 Mr. Potato Head Hasbro Lot 2 Red Earring Part Only Playskool Mrs Ms.
Up for sale is a Mr Potato Head Lot of 2 Red Earring Parts ONLY. Once the window expires an unpaid item case will be opened. 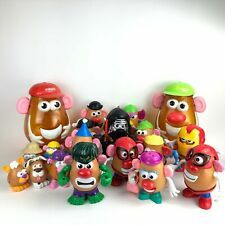 Mr Potato Head Lot Bundle Spider-Man, Transformers, Pirates, 50 pieces. Condition is Used. Shipped with USPS Priority Mail. Spider-Man and Transformer complete with original box. Here is a great lot of Mr. Potato Head parts and accessories. Several of the potatoes are missing their backs. This is a 51 pc. mixed lot of Mr. Potato Head and Potato Head Minis. You get 3 potato heads and tons of accessories! They are pre-owned and have normal wear to them. I have included a single arm for the minis that does not have a match - all other pairs have a match. 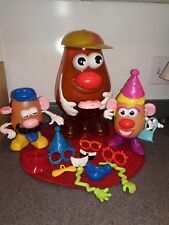 This is a lot of 2,RARE 1985 Pawtucket,RI Mr. Potatoe heads.They are both in wonderful condition,see pics. You will receive everything pictured. Includes the POLICEMAN Potato Head! Used & new Hasbro Mr Potato Head Lot Star Wars & Kiss. condition is as shown in the pictures. ones in boxes are new. 1 LADY WITH HAT. SIGNED ON BOTTOM 1983 HASBRO. Pre-owned with normal signs of use & wear. Mixed lot - includes whatever is shown. Actual color may vary due to lighting conditions. Inside of the 3 larger bodies are marked 1985. See column to the right. Mr. Potato Head Hasbro Lot Pink Red Tongue Part Only Playskool Mrs. Ms. Mr.
Up for sale is a Mrs. Potato Head Pink & Red Tongue Part ONLY. Once the window expires an unpaid item case will be opened. mr potato head body lot 15 total. 4 large, 6 medium, 3 small, and 2 tater tots in good used condition. 2 large bodies. ~Examine our photos for up close details. They are worth 1,000 words! Lot Includes 1 small body. 1 funny face. In gently played with condition. We feature This & That from Then & Now. Set of hasbro lightsabers from the Original trilogies. Played with but not beaten up. Mr. Potato Head Lot. 2 Mr. Potato Heads plus accessories. Great Used Condition. MR POTATOE HEAD COLLECTION. Includes: 185 pieces of Walt Disney-Mickey, Star Wars Princess Leia, Spiderman, and more. This set of Potato Head family is in good lightly used condition. Mrs. Potatohead has three hats, earrings, two sets of eyes, arms, a flower, a purse. There are other pieces too. It’s a great set for playing. Mr Potato Head Lot. PRE OWNED 2 COMPLETE POTATO HEADS IN GREAT CONDITION. THE THIRD ONE IS MISSING PARTS AS SHOWN. Nice lot of Mr. potato head. see photos for everything included. Mr. & Mrs. Potato Head Lots of parts & accesories! Mr & Mrs potato head accessories lot. The larger pirate stuff is for use with a pumpkin or other. Pictures are actual item. In very good condition. Played with very little. Really cute and has storage for extra parts.